This is my first post here on the forum and I would like to begin it by thanking everyone who posts on here; this forum has been a huge source of information for me, basically like the film school I couldn't afford, so yeah thanks everyone. Is this the high speed gate? And if so, is the combination of the gate and the 80fps tach enough to pretty much guarantee this is definitely a high speed model and is safe to run at 80fps? Just want to be sure, as I have a high speed motor on the way and would like to be sure of what I'm dealing with. Speaking of the high speed motor, I've read that it needs 32v to run at 80fps. At the risk of sounding silly, how exactly do I acquire 32v of power? I can't seem to find any 32v batteries that can connect to the high speed motor. (The cable for my motor has a 4 pin XLR). 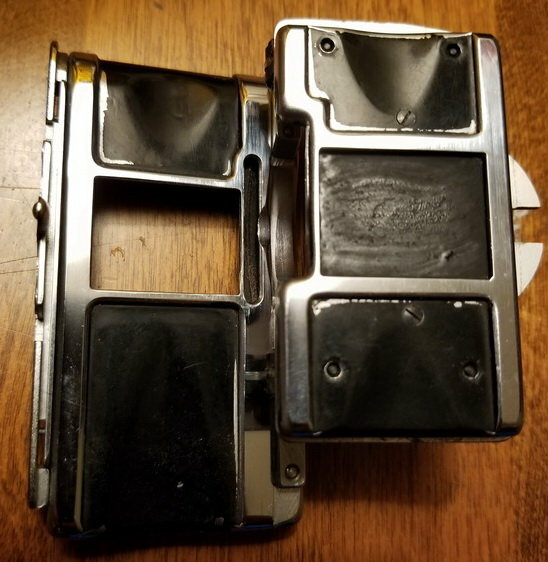 Is it a case where I would need to have a battery specially fashioned? Anyone who has any experience running a 2c at high frame rates, your help would be greatly appreciated! Thanks! I'm not really familiar with the high speed models, but we have a high speed medical 2C in our museum (designed to shoot x-ray film) with an 80fps tacho and the pressure plate is the same as yours. Only one other 2C we have has the same pressure plate (but the tacho is standard 50 fps max), all the other standard speed 2Bs and 2Cs we have don't have the 4 nuts on the back of the pressure plate. So I would assume that yours is a high speed plate. Aside from possibly giving the camera a fresh lube, I don't think you need to worry about anything else. The mags should be OK, 435 literature says you can use older magazines up to 130 fps, well past what your 2C can do. Test with some old stock, if there are issues it might be worth having the mag take-up and feed tensions checked. A mains transformer might be the only sure way of getting full speed. I recall that the Locam 16mm. medium-speed would only ever reach 400fps instead of the rated 500 on battery. 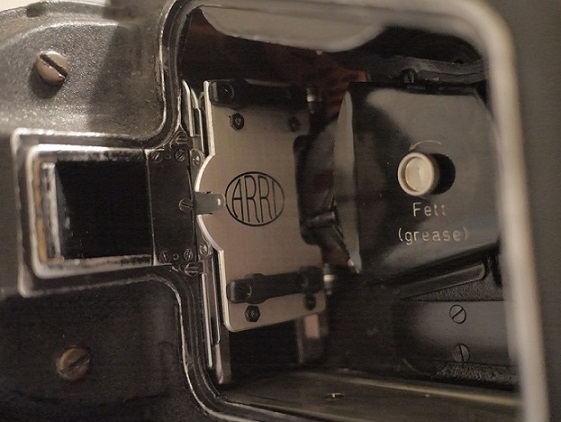 Just like sticking an 80 fps tachometer in a standard Arri 2C, you can also stick a high speed gate in a standard 2C. The pressure plate door on the gate you have pictured does look like a high speed pressure plate door. 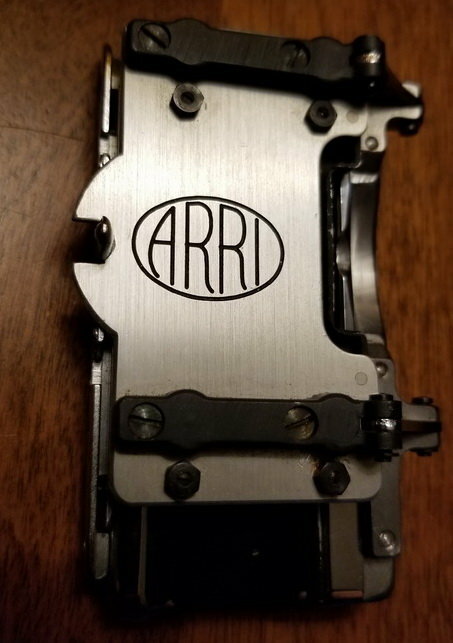 I have an Arri IIB with an academy gate. I am looking for a full aperture (Super 35) gate. I found one on eBay for the IIC but it's a high speed gate. I'm told that it would work and should be interchangeable - though the ground glass assembly might be different. Have any of you ever swapped out your gate before, is it tricky? I have pulled Mitchell and Wall movements before, but it seems like it would be little more difficult because of tight space and mirror clearance. And would you recommend the high speed gate for normal shooting? Some later 3Cs or hard-front modified 2Cs may have been converted to S35, but I don't know how they overcame the claw issue. The 2C viewfinder also won't cover S35 width. I don't think you'll have an issue with a high speed gate, the only difference is the adjustable pressure plate, but it should still be within the pressure specs for normal speed filming. The pressure may be set a little less than usual, that's all. Swapping gates is fairly straightforward, but you need to be careful of any shims that may be underneath. The bigger issue is that with a 2B you can't exchange ground glasses to frame for a different aspect ratio, and the viewfinder optics don't see much past Academy. You could possibly fit a 2C door which might give you a bit more coverage but it all seems a lot of effort to get a tiny bit more width that you can't properly frame for. Thanks for pointing me back to this old thread - it all comes full circle. Earlier in this thread, October 2018, I was asking about this very gate and indeed it seems like the High Speed gate I got is the expanded (full silent) height but Academy width. Since shooting the test, I believe that it's the adjustable pressure plate (just like you mentioned) that is not applying enough pressure for normal speed filming - or perhaps not evenly distributed pressure.